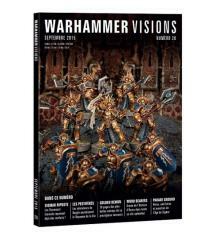 #20 "Sigmar Strikes, Lord of Plague, Golden Demon"
Sigmar strikes as Warhammer Visions 20 arrives and the Stormcast Eternals receive reinforcements in the shape of the Retributors, Decimators and Protectors of the Paladin Conclaves! The battle will be hard won, though, as the Bloodreavers, Blood Warriors and Exalted Deathbringers of Khorne surge forth to meet them. This issue has a look at Latest Releases plus Army of the Month, Golden Demon, ’Eavy Metal, Blanchitsu, a feature on the Corruption of Ghyran, a look at the brand new Chaos Dreadhold, two great collections in the Aurelian Conclave and the Prophets of Eternal Change and loads more. Check it out now.